Notes from the Slushpile: Bye Bye Libraries. Bye Bye Civilization. Bye Bye Libraries. Bye Bye Civilization. That's the gist of Catherine Bennett's piece for the Guardian, listing all the closures expected in the coming government cost-cutting exercise. THINK! 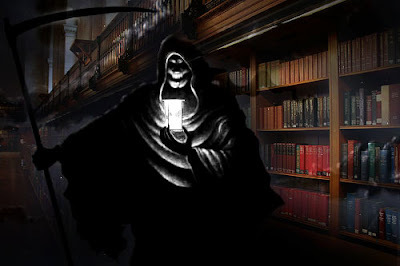 Kill a library and live with the consequences. Close all public libraries ASAP . University and schools already have library. With the internet and ebook readers, ipads, cheap second hand books online and in charity shops, their is no need for libraries. Libraries are nothing more than glorified internet cafes and DVD rental shops. You have to move with the times, Whether librarians like it or not. Shut them all down and use the money for something more useful. 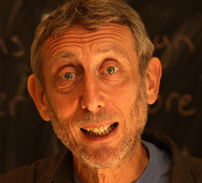 Somewhere down below all the trolls was a comment from Michael Rosen, our Children's Laureate for 2007 to 2009. And I thought it would be a public service to highlight it here. Readers, if you care and if you blog, or have an online profile, please repost this! I hope Margaret Hodge, Ed Vaizey, Ed Balls, and Vernon Cloaker have google alerts on their names so that they can read this and blush (I enlarge your names in case you're as short-sighted as your policies). Shame on you. Books have become optional extras in schools. They've been sidelined by ITC and worksheets. There is now a generation of young teachers who have been through teacher training with no more than a few minutes of training in children's literature and little or no work on why it's important for all children to read widely and often and for pleasure. So, what we have is the notion that there isn't time to read whole books, there isn't time to help all children browse and read and keep reading - but there is time to do worksheets on different aspects of 'literacy'. And yet, the people running education know full well that children who read widely and often and for pleasure find it much easier to grasp the curriculum as a whole. There is an international study showing this. What does this have to do with libraries? If the government (or the last one) had felt willing, all they needed to do was formalise the link between schools and libraries. They could have required every school and every library to lay down some fixed, timetabled sharing of time and resources, which would involve turning the present voluntary arrangements into certain ones. In one fell swoop it would guarantee library-use and massively enhance the children's progress. I put all this in a document in Margaret Hodge's library review where it was immediately ignored. I sent it to Ed Vaizey (because he asked me to), and he too has promptly ignored it. Ed Balls and Vernon Coaker both refused to ask schools to develop their own policies on the provision and reading of books. Neither Ofsted nor schools' 'Self Assessment forms' require schools to make the provision and reading of whole books something that they monitor. In short, education and library ministers aren't really very interested in the idea of everyone reading whole books, and they're certainly not very interested in the idea of every child reading whole books. I even gave them a 20-point blueprint or outline on how to turn every school into what I called a 'book-loving school' (based largely on the TV programme I did 'Just Read'. And that' blueprint is now available on various websites. The ministers I met weren't interested in sending it out, either as it is, or in any adapted form. It's clear that they think 'reading' is about 'doing literacy' ie learning how to 'decode' print. What they don't seem to understand is that literature is one of the main ways in which we can engage with difficult and important ideas in an accessible way. It offers children a ladder between their own personal experience, the apparently 'personal' experience of the protagonists in any given text, and the ideas that are thrown up during the adventures, scenes and feelings that the protagonists go through. So, the reader encounters the protagonists' feelings of, say, pity, anger, fear, guilt, envy and the like but in a school context (or indeed many social contexts) those feelings become talk about those feelings as ideas...eg what is 'pity'? what is 'guilt'? ie through reading, the young reader starts to generalise the particular or put another way, discover abstract thought. Children who read widely, often and for pleasure are the ones who can make the transition between particular experience to abstract thought that all education asks of children between the ages of 8 and 13. The more you read, the easier that transition is. The kids who fall behind don't fall behind because they haven't done enough worksheets. It's because the education curricula haven't helped them discover a wide range of texts through being regular readers. It's about READING, stupid (not 'doing literacy). So, so true, Candy and oh, so tragic and short-sighted. It makes me want to howl. Well spotted Candy. And well put Michael. Would you mind if I copied your entry and put it on my blog as a guest blog? I can't think of anything to add. @kathryn we should howl it to the rooftops. As a seven year old, I can remember waiting with excitement for the teacher to start the next instalment of The Lion, the Witch and the Wardrobe she was reading to the whole class. Ah, those were the days! The pre-Literacy Strategy days, the pre-target setting and box ticking days. Years later, when I started teaching in Primary Schools myself, we read the whole of Aquilea, Blabbermouth, The Turbulent Term of Tyke Tyler… to name a few. We were in the school library at least once a week. Kids sat and read their own books in class - every day. And I don’t think I was an exception. There are plenty of teachers I know who see the immense value of reading whole books and struggle to raise its profile in their schools, determined to make time for it despite Education Ministers giving it low priority and a full-on, straightjacket curriculum. Talking Primary, I say ease off on the amount of material in the curriculum to cover! Allow good chunks of time for reading for pure pleasure! Place trust in the teachers and teachers put trust in yourselves. Thanks, Candy, for blogging this. I feel too depressed about it all. Books and libraries are so important to me... why bother writing books, if children can't borrow them from libraries? what is the point? I'm going to post this on my blog too if that's ok? Thanks for a great post, Candy. I work in a public library and see children learning the joy of reading in it pretty much every day. Senior citizens come up and, without prompting, tell me how important libraries are to their lives. More recently, I am getting worried questions like "this library is safe, isn't it? ".